Sometimes I envy normal people with normal careers. When such normal people travel to Mexico, they get to enjoy margaritas and sunny days at the beach. Or maybe sunny days strolling through picturesque bazaars or scenic historic ruins. And when they come back, the splash of lime juice over a salt-rimmed glass or the happy blare of a mariachi band is all it takes to bring them back. Lucky them. My trips to Mexico were never truly fun – unless your idea of fun involves enduring six-day work weeks filled with frantic note-taking while being snickered at by locals, stalked by bribe-exacting police officers, and practically choked to death by antimalarial prophylactics the size of marbles. So let it be stated for the record that if you’re looking for a carefree good time south of the border, researching indigenous languages in rural Mexico is not the way to go. There were some good things about these trips, of course. First and most importantly, they were the only opportunity of the year for me to get the data I needed for my research back when I was still in academia. Second, they were (practically) free – grants covered most of my costs. (Normal people who kvetch about how hard it is to redeem frequent flyer miles have never had to write a 20-page grant proposal every time they wanted to save themselves some money when traveling.) Third, there was the Indiana-Jones-like cachet of traveling to places so remote they have neither paved roads nor dependable running water. Fourth was the food – locally grown and made from recipes and techniques dating to a time when everyone was a locovore by necessity. The food was incredible enough to keep me going back. But on my third work trip to Mexico, I almost didn’t get to eat anything interesting. This was because my mealtimes were obstructed by a force that never caused any trouble on my previous trips: my travel companions. Both of them – a colleague I’ll call Joel and a graduate student I’ll call Deirdre – were as gringo-y as gringos get – fair-skinned, cold-weather-loving Midwesterners. Since this would be their first trip to Mexico and we’d be traveling to a hot region in the middle of August, I did my best to let them know what to expect. They responded enthusiastically to my e-mails and phone reminders to bring sunscreen, bug spray, and extra batteries for our video equipment, so I figured they were on top of things and ready to go. It was only when we were at the airport about to take off did they drop a major bombshell on me. “Sure,” I said. Well, duh – we were going to be in a tourist-free, predominantly Indian region where even urban Mexicans were a rare sight – how else would we communicate? Joel shook his head. So did Deirdre. “Do you read it?” I asked. Great. My Spanish wasn’t all that great either – I could read it fine and spoke it competently enough to muddle gracelessly through whatever I needed to do, but serve as the mouthpiece for two needy, helpless Midwesterners for three weeks? Not so much. They chose to drop Bombshell Number 2 on me a short time later, when we were looking for dinner in the airport. Here’s the deal: in rural Oaxaca, where we were going to be, the diet of the sustenance farmers in the tiny village where we’d be working was, indeed, predominantly vegetarian – beans, rice, corn tortillas, home-grown vegetables – but the food available to visitors in the slightly bigger market town nearby where we’d be staying and having most of our meals? Our dinner options could be described in three words: carne asada tacos. From my previous trips, I knew these tacos would be wonderful – as would be everything else in the market stalls and tiny food stalls here in town . Oaxaca may be one of the poorest and most primitive states in Mexico, but its native cuisine is among Mexico’s most baroque and creative – for instance, the region is justifiably proud of its seven distinct, equally complex mole sauces , each a colorful and elaborately wrought amalgam of roasted and finely ground nuts, spices, fruits, vegetables, and/or chocolate. Oaxaca’s dishes of pride are what one finds in most restaurants – and while many are vegetarian, many of the best and most beloved of them contain meat. And this is why my mealtimes in Oaxaca on that trip – the times of day that I looked forward to the most – were ruined. We ate breakfast every morning at a tiny fonda – basically a little stall with no written menu – near our hotel in the small market town where we were staying. (Our grant allowed us the luxury of a $10/night hotel, since I figured out – correctly – that my colleagues couldn’t possibly last three weeks in the village, where electricity and running water weren’t guaranteed.) Every morning, the owner of the fonda, the most patient person who ever walked the earth, would come to our table and recite the day’s offerings, which I’d translate into English. And every morning, my colleagues said the same thing. “Does it have any meat in it?” I’d ask as politely as I could in Spanish, wanting to fall through the floor. Almost none of the breakfast dishes, which mostly involved freshly made corn tortillas enrobed in various vegetable-based sauces, did. But this didn’t assuage my companions’ paranoia: in their minds, this alien land was just lurking with invisible critters and critter bits. Even after being assured that everything was, indeed, meat-free, Deirdre rarely believed me (or the poor local I had been interrogating). She’d lift her plate of beans or entomatadas – tomato-sauce-covered tortillas – to her face, sniffing loudly. “It smells like it has meat in it!” she’d wail, as if betrayed. Still, there were some great things about that trip -- and my companions, when I wasn’t trying to feed them. I'll always remember the pleasure of watching their eyes light up at the big Sunday market near our hotel and showing them the amazing 18th century church in the village – which would easily qualify for national landmark status had it been located in the U.S. or Europe. And unlike the crew I worked with back home at the time, they laughed at my jokes and were (mostly) easy and fun to talk to. In the end, we became friends -- although I still wanted to strangle them at mealtimes. So in honor of the Trip From Hell and my vegetarian buds, I’ve devised a vegetarian version of a little-known Mexican sausage variant, green chorizo. Most people are familiar with the bright-red, wonderfully greasy and spicy version of chorizo, but a green version also exists – brightly flavored with cilantro and parsley along with spices and chile. 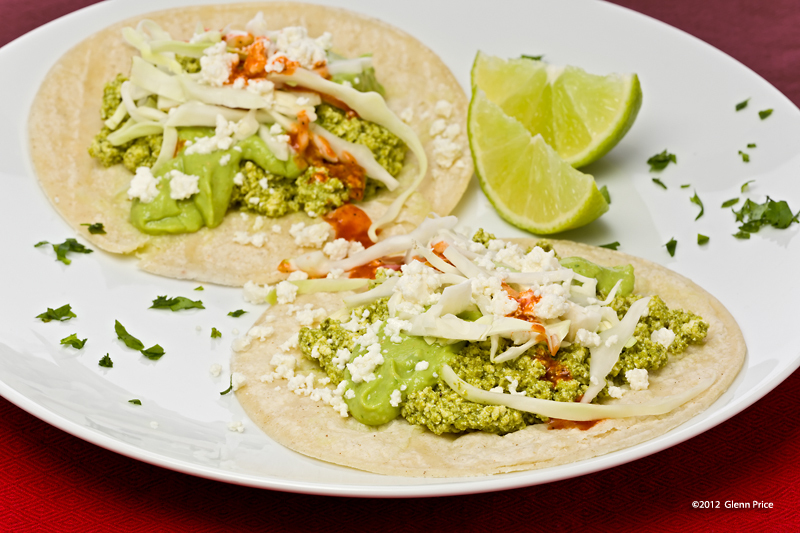 My green chorizo was inspired by recipes by the two Anglophone masters of Mexican cooking, Rick Bayiess and Diana Kennedy. Bayless’s green chorizo recipe is minimalist – a few herbs and chiles ground, mixed into ground pork, and quickly cooked. Kennedy’s version is a bit more complex, involving a puree of spices. herbs, and chile mixed with meat, stuffed into sausage casings, and aged for a short time before cooking. My version combines (most of) Kennedy’s flavorings with Bayless’s weeknight-friendly technique, Using an idea from another chef I admire, Deborah Madison, I made my chorizo vegetarian by using crumbled firm tofu instead of ground pork. It’s not authentically Oaxacan (traditional Oaxacan chorizo is red and shaped into ping-pong-ball-sized rounds), but my version does have a lively, spicy, flavor and pretty green color. It’s lighter and less greasy than “real” chorizo, and appropriate for Lent, St. Patrick’s Day, and dinner with difficult friends you really want to keep, after all. 1.Using your hands, crumble the tofu finely and place in a colander set over a bowl. Allow to drain while you prepare the remaining ingredients. 2. Put ¼ cup of the vinegar in a blender jar and add the garlic, salt, and spices. Blend until all is finely ground. 3.Add the rest of the vinegar and the chiles and blend to a smooth puree. 4.Add the parsley and cilantro and blend to a smooth puree. 5.Put the drained, crumbled tofu into a bowl, add the puree, and mix until thoroughly incorporated. Mixture will be a pretty green. 6.In a heavy sauté pan, heat the oil over medium-high heat. When hot, add the green chorizo and cook, stirring frequently, until the mixture is thoroughly hot and most of the liquid has evaporated. 7. Serve with tortillas and garnishes. This post is part of the monthly, Twitter-based #LetsLunch series -- every month, participants share their recipes and stories about a dish reflecting that month's theme. This month is green food month! I'll post links to fellow #LetsLunchers in a bit -- now's a great time to enjoy your veggies! Felicia, I love this story and the very creative recipe. And admire your patience with your difficult-to-dine-with traveling companions. Oh, I loved your story. As food lovers, it's so frustrating when you're with unadventurous eaters. Being from the south, many in my family think that every time I come for a visit I will be introducing them to odd and weird food stuff - you know, like gravlax and bearnaise sauce, haha. Love the pics of your food, too. Bookmarked for sure! Linda--Thanks so much! This recipe really is nice; it's in my regular weeknight rotation. Cathy--So glad you enjoyed it! As a recent transplant to the south, I think Southern food can be pretty odd -- boiled peanuts? -- but I'm always up for trying it! Clever girl! Too bad about the traveling companions, but they did inspire an amusing tale and this delicious-sounding recipe! Are you sure you don't write for Portlandia? This was so fun to read, although I'm sure it was not fun at the time you translating menus for your companions! I love the combinations of flavors here, and I love tofu anyway. Ha, ha, I've had similar experiences in my cooking classes with vegetarians. A first with green tofu, love the natural dye from veggies, how creative. Lucy - Adversity builds character, as well as new recipes! Grace-- Thanks! This recipe works well for both tofu lovers and haters. Eleanor -- I can totally see how they'd get like that in your classes; vegetarians get extra-paranoid around unfamiliar cuisines involving lots of sauces (perhaps rightfully so from their perspective! )I'm sure you found a graceful way to handle them, though!